Added by Debra Tash on June 24, 2018. 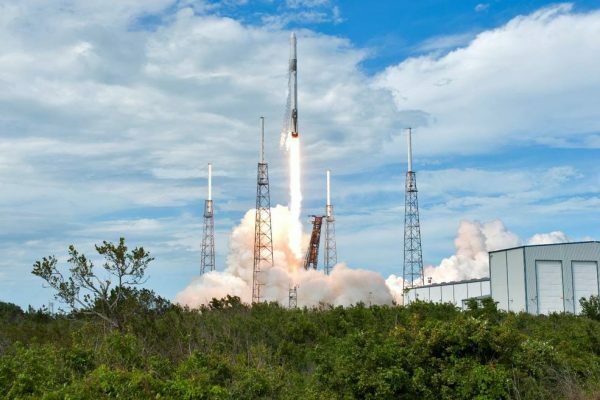 NASA commercial cargo provider SpaceX is targeting no earlier than 5:42 a.m. EDT Friday, June 29, for the launch of its 15th resupply mission to the International Space Station. Live coverage will begin on NASA Television and the agency’s website Thursday, June 28, with prelaunch events. Packed with more than 5,900 pounds of research, crew supplies and hardware, the SpaceX Dragon spacecraft will launch on a Falcon 9 rocket from Space Launch Complex 40 at Cape Canaveral Air Force Station in Florida. About 10 minutes after launch, Dragon will reach its preliminary orbit. It then will deploy its solar arrays and begin a carefully choreographed series of thruster firings to reach the space station. It will reach the space station Monday, July 2. NASA astronaut Ricky Arnold, backed up by fellow NASA astronaut Drew Feustel, will supervise the operation of the Canadarm2 robotic arm for Dragon’s capture while NASA astronaut Serena Auñón-Chancellor monitors the spacecraft’s systems. After Dragon capture, ground commands will be sent from mission control in Houston for the station’s arm to rotate and install it on the bottom of the station’s Harmony module. Christian Karrasch, project lead at the German Aerospace Center (DLR), and Philipp Schulien, project engineer at Airbus, will discuss the Crew Interactive Mobile companion (CIMON) study into crew efficiency and acceptance of artificial intelligence (AI) support for future use on long-duration missions. Principal investigators Richard Grugel at NASA’s Marshall Space Flight Center and Oliver Steinbock at Florida State University, will discuss Chemical Gardens studying the physics of nanotube growth. Simon Hook, principal investigator at NASA’s Jet Propulsion Laboratory, and Woody Turner, program scientist in the Earth Science Division at NASA Headquarters, will discuss the ECOsystem Spaceborne Thermal Radiometer Experiment on Space Station (ECOSTRESS) investigation. This study will answer several key science questions related to water stress in plants and how selected regions may respond to future changes in climate. Paolo Luzzatto-Fegi, principal investigator at the University of California, Santa Barbara, and Richard Dickinson, director of the Division of Chemical, Bioengineering, Environmental, and Transport Systems at the National Science Foundation, will discuss Quantifying Cohesive Sediment Dynamics for Advanced Environmental Modeling (BCAT-CS), which focuses on the study of forces between particles that cluster together by studying sediments of quartz and clay particles. Ken Podwalski, director of Space Exploration Operations and Infrastructure for the Canadian Space Agency, will discuss the spare Canadarm2 Latching End Effector (LEE) being launched. 12:45 p.m. – Prelaunch news conference from NASA’s Kennedy Space Center in Florida with representatives from NASA’s International Space Station Program, SpaceX and the U.S. Air Force’s 45th Space Wing. 8 a.m. – Postlaunch news conference at Kennedy with representatives from NASA’s International Space Station Program and SpaceX. 5:30 a.m. – Dragon rendezvous, grapple and berthing at the space station. Capture is scheduled for approximately 7 a.m.